"We want this product to change your life and to make your life easier. And we are a company, as passionate and enthusiastic about water conservation as we are about the products we make - products that help grow beautiful, healthy landscapes and gardens." The micro spray pot stake kit would be awesome. My soil is so terrible that I have to plant all of my veggies in pots and some days I just don't have time to water. This would work great! I think the premium all in one kit is going to work best for my bigger garden. 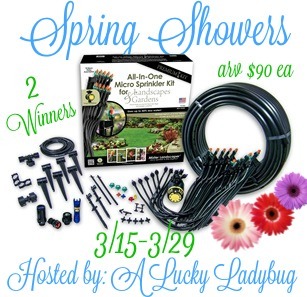 The all in one micro sprinkler kit will be great to have. Thank you for the entry.